All over the world, fish are at the heart of people's diet and culture. And in the Pacific Northwest, there is no fish like the legendary salmon. But decades of poor fisheries management and habitat loss have decimated many wild salmon runs. Now there's a new way to produce fish - raising them in giant underwater cages known as "net pens." At first, these pens and the salmon farms that use them seem like a good idea, providing more fish for consumption, while taking the pressure off their wild counterparts. 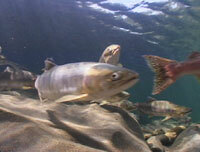 But the farms themselves have become a serious new threat to the survival of wild salmon. Filmed in Chile, Washington, and British Columbia, NET LOSS assesses the risks and benefits of salmon farming through interviews with government and industry spokesmen, who make the case for salmon farming, and the fishermen, native people, and scientists who extol the dangers it poses and the damage it has already done. "Net Loss probes one of the most important and cautionary tales for the future relationship between humanity and the sea. We need to think long and hard about this film." "An old Chinese proverb, 'The fish sees the bait, not the hook; a person sees the gain, not the danger', warns of the unexpected consequences of new technologies. 'Net Loss: The Storm Over Salmon Farming' introduces many of the consequences of salmon netpens, at the same time as it humanizes their effects for individuals and cultures in regions from Chile to the Pacific Northwest." "An extraordinary and timely film." "Fairly portrays the positions of salmon farmers, conservationists, First Nations, traditional fishermen and government officials. It is a thorough examination of the growth of the industry in British Columbia and Chile, and the effects of the industry on the environment and other economic sectors." "A fantastic job of telling the entire industrial salmon farming story - from one end of the planet to the other, and from the producer all the way to the consumer. This is the film to show your friends and colleagues who still think that buying farmed fish is the best way to protect wild salmon or to feed the world. NET LOSS is a myth buster par excellence!" "A wonderfully relevant film...Net Loss provides an emotional and meaningful perspective on the noble fish - salmon - and our relationship to this being." "Shines a much-needed light on the fact that not all salmon are created equal. The well-balanced film clearly shows that there are major issues associated with farming salmon. The film basically asks, what price, in terms of environmental and social costs, are we as consumers willing to pay for the flood of cheap farmed salmon?" "This documentary states the case against farming salmon in large underwater cages or 'net pens', and looks at the widespread economic and evironmental repercussions, which stretch all the way from Alaska to Chile. Net Loss is an indictment of mass consumption, powerfully illustrated by the destruction of a great Northwestern symbol - the wild Salmon." "Compelling...the evidence presented by those who have lived and loved salmon all their lives, when seen next to the trite reassurances of aquaculture advocates, speak volumes...The film's clarity and detail in coverage of such complex subject matter makes it ideal for a range of audiences...[Net Loss] adds a human face and context for understanding the global environmental, social, cultural and scientific dynamics that have led to 'the storm over salmon farming'." "The makers of [Net Loss] were careful to include the varying perspectives of salmon farmers, scientists, native North Americans and advocacy groups. The result is an objective documentary that should have broad appeal. One can frequently find farmed salmon in grocery stores selling for four or five dollars per pound. Net Loss makes one realize that the true cost of farmed salmon is much higher. This documentary is highly recommended for adult and high school audiences." "This timely film, combining lush photography, lively music, and an engaging narrative, lays out the issues in a way that is understandable and highly watchable." "True to its intent of presenting the issues of salmon farming and...objective in its representation of both sides, not telling me what to think, but rather what to think about...strong, well organized, pressing and passionate... covering more than the economic/environmental issues but cultural/social issues as well." "[Net Loss] offers a visual and narrative cost/benefit analysis useful for those whose interests range from aquaculture to zoology...The facts, theories and processes of science are well illustrated, with examples of field investigation, data collection, analysis and synthesis presented with a view toward purposeful investigation: observations and data help make a case for the need to address the dangers that salmon farming poses to the marine environment and local coastal communities...a newcomer to the issue may be...drawn in by the film creators' ability to present the complexity of the controversy in a palatable way, inviting viewers to seek more information and draw their own conclusions. Recommended."